Home was a lovely mixture of cheap Mexican food, sushi, work, and friends. But 6 weeks was more than enough. Time to head back out. This time, eastward, across a continent and an ocean. To the island home of my ancestors, then a little country home to wine, cheese, and most importantly, the 82nd running of the most epic racing event of the modern era. So begins Around the World in Many Days, Part 2. So I got tickets the hour they became available. The first half of the trip worked itself out backwards from there, and now, thanks to my new mindset about travelling, the entire trip has expanded quite a bit. 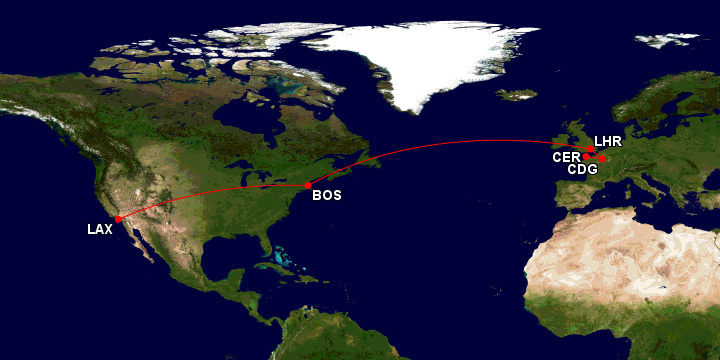 After a week in Boston for a friend’s wedding, I’m heading to London. It was a LOT cheaper to fly to London than Paris (the next stop), and besides, I have some amazing friends there I can’t wait to see (i.e. drink with). From there, I head through some little tunnel, and across the fields of France. As a history buff, I’ve always wanted to see the beaches at Normandy. This June is the 70th anniversary of D-Day. Cool. So I’m going to be there for that, and cover it for CNET. I also seem to be staying at what was apparently the last hotel room in the province. After that, I head to Mont St. Michel, which I’ve wanted to visit since I first learned about it (in high school?). And then… the 82nd running of the 24 Hours of Le Mans. I’m not into the sports, and I don’t follow most car racing. But there’s something about Le Mans. The ultimate test of man and machine. There’s nothing like it. Check out the free Truth in 24 and the sequel, for an idea what it’s about. There’s a Steve McQueen movie too. This year I won’t be rooting for Audi, however, since it’s Porsche’s first time back in 16 years. I’ll be covering this for CNET too, even though I was, quite amusingly, flat out denied a press pass. But after Le Mans… I have no idea. Midsommer? Dubai? Back to Britain, Ireland? Not sure yet. I’m open to suggestions. If you’ve got a couch I can crash on and an airport I can fly to, I’ll ply you with whatever booze you’d like.